How will fans love thee? Let us count the ways. 1. Apple relies on its existing customer base to drive initial sales on all new products. Apple has sold over 500 million iPhones. Their customers have the highest upgrade % of any comparable smart phone. As they say, the existing customer is the easiest and ‘cheapest’ to sell. If you own an Apple product, you have already received many emails about the Watch. Apple knows how to mine it’s customer base, and they are uniquely successful at extracting money from their customer’s wallets. 2. Apple customers are “discreet adopters”. Apple never introduces a new device (think iPod, iPhone, iPad) that isn’t tested and performs at the highest level. Apple is not the first to jump into the new product space — they take a wait/see approach, figure out how to do it better, and then fill in all the gaps and produce exquisitely designed devices that are superior in execution in all areas. Samsung has given them a ‘run for their money’ but they’re perceived as a lower-tier product — certainly not on the same prestigious level with Apple, regardless of their performance. 3. Apple’s customers are brand loyal. They ‘believe’ and ‘trust’ just about everything Apple says about its products. But these customers don’t just take Apple’s word for this — they know first hand that Apple products perform as expected, and they learn that their customer service is superior. Yes, they pay more and are eager to do so, but they honestly believe their products are worth it. For example, they know from experience how polite, courteous, and knowledgeable the ‘geniuses’ at the Genius Bar are. And they love how they can ‘experiment’ and access all Apple products in their store. All this builds their brand — they know that every contact they have with their customer is a solid building block for selling future products. 4. Apple’s snob appeal. Make no mistake about it — Apple is a luxury product. They never discount. They don’t put on “sales” in Apple stores. That Apple logo that shines brightly from your laptop in a Starbucks says this about you: I have an Apple laptop….I paid top dollar for it….I am the kind of person who wants and needs the best…I am proud to be an Apple user. Being an Apple user also says that you appreciate quality products and services because that’s the kind of person you are. You want the best. And wearing the new Apple Watch on your wrist for everyone to see will just be another way to express your commitment to the highest quality, the best. In many ways, Apple users are tech snobs. And they’re proud of it. 5. Apple’s frenzied cult. This brings us to: Is Apple a cult? Of course, it is. It was always Steve Job’s vision to create the best computer in the world, the MacIntosh. Then the iMac….then the MacBook…..iPod….iPhone. And now, Tim’s Watch. Apple customers have been enraptured by the company’s products, its culture and position as a truly luxury brand, they have almost a blind passion for any new product. They will ‘blindly’ buy their next new thing because even if they may not need it, they want it. This is based on customers wanting to always be “cool”, “chic”, tech-savvy, smart. Apple customers believe so strongly in the Apple methods of inventing new things, they want desperately to be the owner of their latest invention. It’s a sign that “I am truly a member of the one of most exclusive clubs in the world.” I may not be able to join the country club, but I can own an Apple Watch and enhance my own brand at the same time. Passionate Apple users also believe they truly own and depend on the best products in the world that makes their life better. Apple is not a commodity — it’s the #1 brand in the world today (and the most valuable) that stands for something truly great — Superior Invention. Superior Design. Superior Innovation. These are the common themes in the reviews we have seen on previous Apple products, and the Watch is no different this time around. 6. Apple takes advantage of its market position. They are not fools ….they can be arrogant for sure, but for the most part, it’s deserved arrogance. They have earned, time again and again, the loyalty of their customers because they have delivered in the past. Consequently, they rely on an established and proven methodology for creating and marketing new products that limits (or eliminates) failure. There have been glitches — the antennae on the early iPhone was one — and the Apple Map app was a disaster. Since Jobs created the first new Macs after his return to the company in 1996, their development and marketing process has essentially remained the same. The only difference Jobs made the second time around was to open up the source code so they could extend their programming and offerings to users without having to spend the $$ on them. Hence, there are over 1.2 million apps today for the iPhone and developers are now pushing for new apps for the Watch, although we doubt it will handle that many apps. 7. Apple is the World’s Biggest Tease. Think about it: We have been teased about the Apple Watch for over a year. This teaser campaign is perhaps the best marketing strategy ever created in the history of new product launches. Nobody does it better. Not even James Bond. And what this does is create a “feeding frenzy”. I asked a gentleman last night in a restaurant who was dining with his wife….they were both looking down at their iPhones — he had a 6, she had a 6 Plus (and proud of it). I asked him if they ever talk at dinner anymore….they laughed. Of course we do. 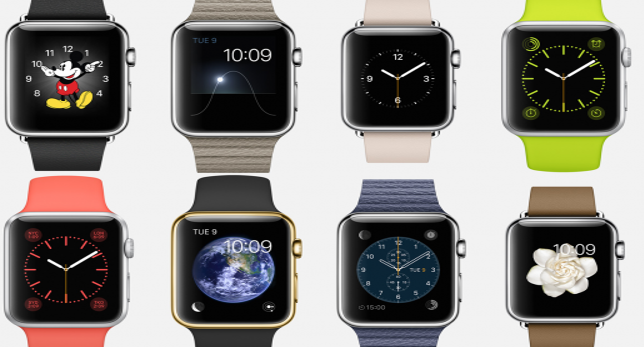 Are you getting an Apple Watch…she emphatically said “no.” He, on the other hand, nodded ‘yes’, with a huge grin. “Have to. It’s my destiny.” Think about that….his “destiny”? Every brand marketer in the world wants this kind of customer loyalty. 8. Apple is the ultimate creative force. There is an old marketing adage: The Creative Plan is the Marketing Plan. I learned this while at Disneyland years ago. Disney’s creative plan — designing and operating the world’s best outdoor attraction — was the reason for its success. Not its marketing. And what makes Apple’s marketing so effective is that their products are so damn gorgeous and work flawlessly (most of the time), they require less marketing than what their competitors must spend. The brand extensions from Apple II to the Watch have proven winners every time. Steve Jobs is responsible for building this creative culture. And yes, he was a meanie. He wasn’t always the nicest guy. They got rid of him once. But it was his devotion to creating the world’s ultimate products that serves today as their foundation for being the world #1 brand and most valuable company. With every new launch, Apple takes its brand equity for a spin. They use this equity — tangible and intangible assets — to insure that their products are superior in every aspect of their design, function, and purpose, but more importantly, Apple hires the best “experts” in their field to guide the company down a new path — in this case, the watch business. They recruit the best and brightest (“who can resist?”) from the world market and make sure that they pay attention to their cultural beliefs and practices at every turn. They may, perhaps, stumble on the Watch launch, but for any company to take on such a mammoth undertaking in a whole new category — such as the tradition-bound watch business, there is no company better qualified to take this plunge than Apple. They’re not betting their farm on this one product — but they are indeed dealing from a position of strength. It’s a marvel to watch, pun intended. Am I going to get the Watch? Yes. When? Not sure. I have gleaned myself from the frenzied rush to stand in line for hours or dial 17 times to reach an Apple order taker after the clock strikes Midnight. I’m older now…and besides I have learned that, like with the Watch, I don’t really need it. I want it. And yes, it’s my destiny.